Renowned for its significant colonial history and rich heritage, Massachusetts is packed with interesting historical sites, museums and galleries, fine dining restaurants, superb hotels and resorts, and spectacular natural scenery. The capital city of Boston and home of the Red Sox is famous for its food markets and mouthwatering clam chowder, notable art institutions, and galleries, and the Freedom Trail, which features an array of sites related to the American Revolution, such as the Bunker Hill Monument. Cape Cod is the place to go for beautiful beaches and fresh seafood, while Martha’s Vineyard is worth a visit for its sheer beauty and tranquility. Set on 27 acres of pristine landscapes, the Wequassett Resort and Golf Club is an upscale beachfront golf resort just two miles from the Cape Cod National Golf Club with access to an 18-hole championship golf course. The resort boasts comfortably furnished guest rooms and luxury suites with en-suite bathrooms, private hot tubs, living areas sofa beds, and private patios with outdoor fireplaces or fire pits. Modern amenities include flat-screen televisions and complimentary wireless Internet, and a deluxe three-bedroom suite offers a dining table, an elegant lounge, and an expensive deck with panoramic views. Dining options include an excellent dining restaurant, a casual tavern, and a laid-back beachfront bar, and guests have access to facilities such as four tennis courts, two outdoor swimming pools, hot tubs, two beaches and a dedicated children’s club. Set on the award-winning Blue Rock Golf Course, Blue Rock Resort is a Cape Cod resort with a meticulously-maintained, championship par-3 golf course, well-appointed accommodations overlooking the scenic greens of the award-winning golf course, and an array of first-class amenities. Guest rooms are comfortably furnished with en-suite bathrooms, and modern conveniences such as flat-screen televisions with cable channels, coffeemakers, and mini-fridges and amenities range from a heated outdoor swimming pool, a full-service restaurant serving gourmet cuisine, and the Blue Rock Lounge serves signature cocktails and other libations. Guests can enjoy a variety of services and amenities at the nearby sister resorts, such as access to private beaches, spa treatments, nature programs, and supervised children’s programs. 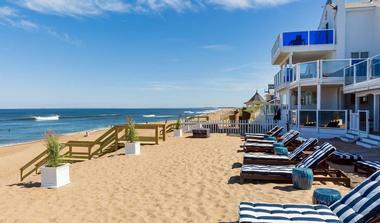 Overlooking the Atlantic Ocean from the shores of Plum Island Beach, Blue - Inn on The Beach is a boutique hotel in Newburyport with Oceanside accommodations and deluxe amenities. 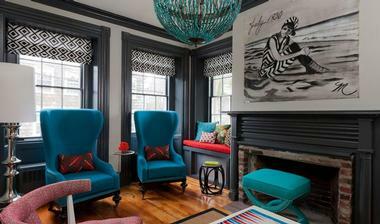 A short drive away from the restaurants, bars, and shops of Newburyport, the hotel features airy, well-appointed guest rooms with en-suite bathrooms, sitting areas with fireplaces and flat-screen televisions, coffeemakers, mini-fridges and microwaves, and balconies with ocean views. Suites have kitchenettes, hot tubs, terraces with barbecue grills, and direct beach access, while cozy one and two-bedroom cottages have fully-equipped kitchens, living rooms with sofa beds, and rooftop terraces with spectacular views. Breakfast baskets are delivered every morning, and guests have access to a pretty courtyard with a hot tub in which to unwind. 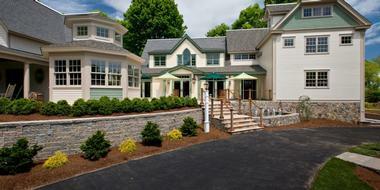 The Berkshire Mountain Lodge is a deluxe resort-style retreat near Lenox that provides a comfortable and relaxed base from which to explore the cultural art haven of the Berkshires. Surrounded by beautiful countryside, the lodge features one-bedroom condominiums equipped with modern amenities such as full kitchens, cozy living and dining areas, as well as inviting bedrooms and en-suite or private bathrooms. The Berkshires offer an array of attractions and activities to enjoy from outdoor pursuits such as hiking, mountain biking, horseback riding, skiing and skating to more relaxed activities such as shopping, perusing numerous open-air bazaars and markets, pampering at the local spa, fishing, and swimming. Set on a magnificent 220-acre estate, Blantyre is a plush hotel based in a beautifully restored and maintained Tudor Revival mansion that offers an elegant retreat in the heart of Lenox. 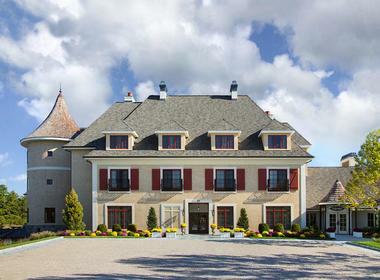 The luxurious hotel features stylishly-appointed guest rooms in both the main house of the estate and the carriage house, which boast antique furnishings, romantic four-poster beds with deluxe linens, en-suite bathrooms with rainfall showers, sitting areas with fireplaces, and private patios with breathtaking views of the estate grounds. Secluded cottages offer extra space, kitchens for self-catering, and porches or decks. Upscale amenities include an acclaimed restaurant serving globally-inspired cuisine, a luxury spa with a sauna and hot tub, a seasonal outdoor swimming pool and tennis courts, an ice rink, a cross-country ski trail, several hiking trails around the property, and a separate cabin with televisions and table games for rainy days. Blantyre is situated one mile from The Mount (Edith Wharton's home) and eight miles from the Berkshire Botanical Gardens. 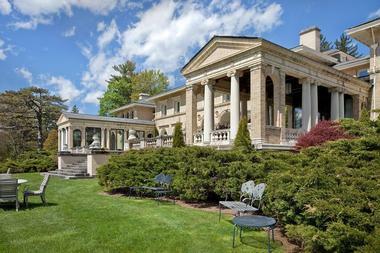 Tucked away in The Berkshires on 120 acres of pristine gardens and grounds with the historic Bellefontaine Mansion as the centerpiece, Canyon Ranch is one of the top wellness destinations in the country. The luxury health resort boasts a 100,000-square-foot spa and wellness center with indoor and outdoor swimming pools, hot tubs, a fully equipped gym, and a variety of holistic treatments. Beautifully appointed accommodations are spacious and elegantly furnished with flat-screen televisions and cable channels, iPod docks, mini-fridges and coffeemakers, washers/dryers, and complimentary wireless Internet. A relaxed health-conscious restaurant and a Mediterranean café serve gourmet organic cuisine, and other recreational facilities include tennis courts, an indoor running track, paddle-boarding and loaner bikes for exploring the vast estate. Established in 1914 as a semi-private hunting lodge, Chatham Bars Inn Resort & Spa is now a luxury retreat and spa that offers the quintessential Cape Cod Experience. The elegant beachfront resort features beautifully appointed and stylishly decorated guest rooms with deluxe bedding and designer linens, spacious en-suite bathrooms, flat-screen televisions, Bose Wave radios, Nespresso coffeemakers, and breathtaking Atlantic Ocean views. Adults-only suites and private cottages have living rooms with fireplaces and saunas for guests wanting extra levels of privacy and romance. First-class amenities include a luxury spa, a heated oceanfront swimming pool, a croquet and tennis courts, a fully-equipped fitness center, and a private beach with loungers. Several restaurants offer a variety of cuisine from an upmarket steakhouse to a casual beachfront café, and a complimentary shuttle provides rides to Cape Cod National Seashore. Set on 380 acres of beautiful landscapes in the heart of the Berkshires, the Cranwell Spa & Golf Resort is a premium, year-round golf resort with first-class amenities including a luxury spa and fitness center, indoor and outdoor swimming pools, and an 18-hole championship golf course. Surrounded by exquisitely manicured gardens and grounds designed by Frederick Law Olmsted (designer of New York’s Central Park), the elegant resort features plush guest rooms and suites spread across seven buildings with en-suite bathrooms, whirlpool tubs, fully equipped kitchens with washer/dryers, and modern amenities such as flat-screen televisions, CD players, coffeemakers, and complimentary wireless Internet. Additional facilities and guest services at the resort include seasonal cross-country skiing and snowshoeing passes, ice-skating, tennis and private golf lessons. Guests can dine at an acclaimed restaurant that serves global cuisine or a casual café and tavern and enjoys drinks on an open-air terrace with spectacular views. Located in historic Back Bay overlooking Copley Square in the heart of Boston, the Fairmont Copley Plaza is an elegant grande dame of a hotel that dates back to 1912. The luxurious retreat features beautifully appointed guest rooms with flat-screen LCD televisions, iHome docks, and high-end coffee machines, while sleek and sophisticated one-bedroom suites have soaring cathedral ceilings, marble en-suite bathrooms, and decorative fireplaces and marble bathrooms. Executive rooms on the Club Floor have access to a stylish lounge where free continental breakfast and evening hors d'oeuvres can be enjoyed. Deluxe amenities at the hotel include an American brasserie serving farm-to-table fare, a 24-hour rooftop fitness center, and over 23,000 square feet of conference space for special events and functions. Located on 7.5 acres of beautiful ocean-facing land in the historical district of in West Yarmouth, the Green Harbor Resort is a casual beachfront hotel with comfortable accommodations, modern amenities and an array of activities on offer. Just a few miles from Hyannis Harbor in Cape Cod and the Blue Rock Golf Course, the resort features well-appointed accommodations in the form of suites, cottages and townhouses with kitchens or kitchenettes, coffeemakers, microwaves, fridges, flat-screen televisions and cable channels, balconies or terraces with outdoor charcoal grills and ocean views, and complimentary wireless Internet. The resort has a private beach, an outdoor swimming pool, and a miniature golf course, and bikes, canoes, and rowboats can be rented for fun in the ocean. Set on a private beach overlooking Nantucket Harbor, Harborview Nantucket is a luxury hotel offering luxurious multi-bedroom cottages with gorgeous ocean views. 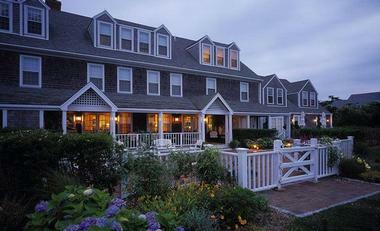 A short walk from the town center with its restaurants, cafés, bars, and shops, as well as the ferry terminal, the hotel features cozy cottages with wood beams, modern décor, en-suite bathrooms with showers, kitchens, living areas with fireplaces and flat-screen televisions, and complimentary wireless Internet. The beach has sun loungers and umbrellas, and airport and ferry terminal shuttles are complimentary. Located a stone’s throw away from the famous home of the Red Sox, Fenway Park, and Boston University, Hotel Commonwealth is a deluxe hotel in the heart of Boston that is an ideal base for exploring the city. 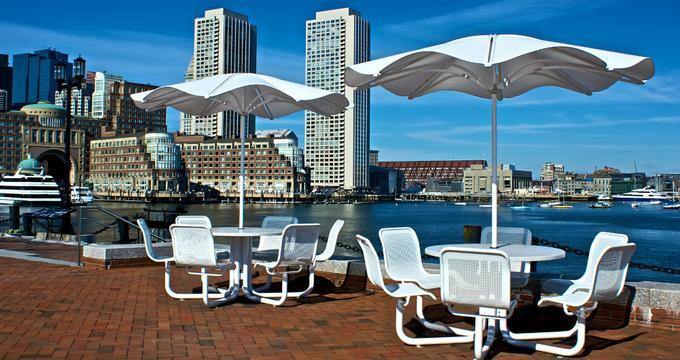 Set in Boston's Back Bay, the upmarket hotel features elegantly appointed guest rooms with designer bedding, marble en-suite bathrooms, and an array of in-room conveniences including Smart TVs, Nexus tablets, and complimentary wireless Internet. 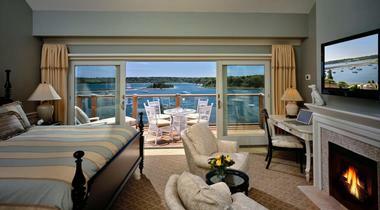 Hotel amenities include a refined New England-inspired restaurant, an oyster bar serving freshly shucked oysters and shellfish, and a cocktail bar with an extensive list of signature cocktails, craft beers and fine wines from around the world. 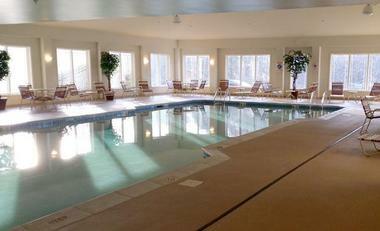 There is also a fully equipped fitness room and 12,500 square feet of meeting and event space for special functions. Jiminy Peak Mountain Resort is an all-suite mountain retreat with slope-side accommodations, several dining options, a village center with shops, and easy access to the slopes for great skiing and snowboarding. Located 10 miles from Balance Rock State Park, the resort features one-bedroom suites with en-suite bathrooms, kitchenettes and living rooms with pull-out sofas, and modern amenities such as flat-screen televisions with cable channels, and complimentary wireless Internet. The resort is home to a food court with a variety of cuisines, a seasonal café offering coffee, specialty drinks, and light fare, and an upmarket restaurant with a brewery and craft beers on tap. Guests can enjoy access to over 40 ski trails, and there is a ski shop selling snow essentials and a general store. 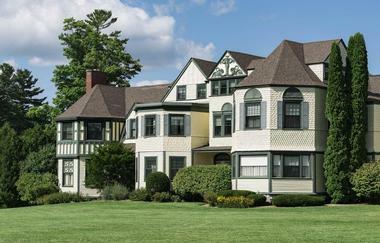 Located seven miles from Plimoth Plantation, the Mirbeau Inn and Spa in Pinehills is an elegant manor house with luxury lodging that offers lavish accommodations, a luxury full-service day spa, and an art-deco French restaurant. The inn features elegant guest rooms with en-suite bathrooms boasting soaking tubs and walk-in rain showers, custom-made beds with designer linens, and fireplaces, and deluxe suites have standing balconies with charming views. An art-deco French restaurant offers an exceptional dining experience, while a casual bistro/wine bar overlooking the gardens is more relaxed with light fare and excellent wines. An exclusive day spa has an outdoor whirlpool tub, and a variety of massages, body treatments, and fitness classes, and there are two 18-hole golf courses for golf-lovers. Mirbeau Inn and Spa in Pinehills is a short drive from the First Parish Church in Plymouth, the oldest continuous church in the US. Located in the historic town of Brewster in Massachusetts, Ocean Edge Resort & Golf Club is a romantic seaside retreat with breath-taking views of the ocean. Guests can choose to stay at The Mansion, where Old World splendor meets timeless grace with newly renovated accommodations overlooking Cape Cod Bay, or in The Villages, where elegant villas are dotted around the Nicklaus-designed championship golf course. Each as luxurious as the other, The Mansion and The Villages have modern décor and deluxe amenities that cater to every need. Guests staying at The Mansion enjoy exclusive access to a private beach, two swimming pools, a state-of-the-art tennis complex, fitness studio/ cardio/weight room, and spa treatment room, while cozy Bayzo’s Pub and the indoor/outdoor Ocean Terrace offer award-winning cuisine in a spectacular setting. Nestled on the Nicklaus Design golf course, The Villages enjoy direct access to the Cape Cod Bike Trail, as well as six beautiful beaches. Set on six acres of pristine woodlands and natural landscapes, Pleasant Bay Village Resort is a casual, low-key hotel just under five miles from Pleasant Bay and Chatham Lighthouse Beach. The resort features well-appointed lodgings in the form of guest rooms, suites and studios, which have deluxe bedding and marble en-suite bathrooms with showers and whirlpool tubs, full kitchens with granite countertops, dishwashers and microwaves, screened-in porches or patios with outdoor grills, and modern conveniences such as flat-screen televisions with cable channels, mini-fridges, coffeemakers, and complimentary wireless Internet. The resort boasts beautiful gardens and grounds in which to relax with an outdoor swimming pool, and an elegant dining room featuring 18th-century antiques hosts a gourmet breakfast every morning. The Breakers Resort is a four-star hotel a short walk from the center of Dennisport and a few miles from the Cape Cod Inflatable Park. Situated next to a museum, theater, and historic lighthouse, the Breakers Resort features well-appointed guest rooms with individual climate control, work desks and chairs, en-suite bathrooms with soaking tubs, showers, and hairdryers, ironing boards, and flat-screen televisions. The Ebb Tide and Ocean House Restaurants serve an array of global cuisine against a backdrop of beautiful ocean views, a seasonal outdoor swimming pool, and barbeque grills are available for use, and guest services include laundry and ironing services, 24-hour reception, and free parking. Located two blocks from Children's Beach, the Nantucket Hotel & Resort is a stately hotel set in a beautifully preserved building dating back to 1891 that offers a refined and elegant retreat. 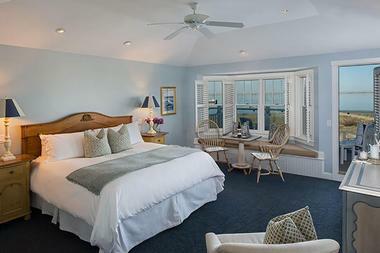 A short walk from Nantucket’s famous Historic District, the hotel features beautifully appointed guest rooms, suites, and cottages with deluxe bedding, en-suite bathrooms, kitchenettes, and private decks with lovely views. Cabins have bathrooms with vintage soaking tubs, and washer/dryers and modern amenities in all lodgings include flat-screen televisions with cable channels, mini-fridges, coffeemakers, and complimentary wireless Internet. Guests have access to a full-service day spa and fully equipped fitness center, as well as two seasonal heated outdoor swimming pools and a hot tub, and a casual restaurant with a year-round deck serves ocean-inspired New American cuisine. 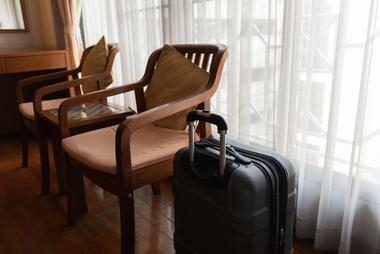 The hotel offers a complimentary seasonal shuttle service to the ferry and beaches. Set on a 429-acre estate that backs up to Cape Cod Bay in Brewster, the Villages at Ocean Resort is a deluxe resort centered around an 18-hole Jack Nicklaus-designed golf course and breathtaking ocean views. Located 1.7 miles from Roland C. Nickerson State Park, the resort features modern one-to-three-bedroom villas with kitchenettes with washer/dryers, living rooms with pull-out sofas, fireplaces, and dining areas and private balconies or patios with charming views. An English-style tavern serves hearty, pub-grub, and a seasonal poolside café offers light bites and colorful cocktails, and resort facilities include four swimming pools, two fully equipped fitness centers, 11 tennis courts and a dedicated kids' club. Bikes can be rented to enjoy the 26-mile bike trail around the estate, and a beach shuttle is available during the high season. Set on the charming Nantucket Island, the Wauwinet is a luxury ocean-side hotel dating back to 1875 and offering an opulent first-class retreat. The hotel features elegantly appointed guest rooms with flat-screen televisions and cable channels, DVD players, complimentary wireless Internet, and beautiful garden or ocean views, and as well as deluxe suites and cottages with fireplaces and outdoor decks. Upscale amenities include two private beaches and an exclusive spa offering stone massage and algae wrap treatments, bikes, and paddleboards to use free of charge, a refined restaurant serving fresh seafood and signature cocktails, a fully-equipped business center, and complimentary ferry transportation. Just a short drive from the Coskata-Coatue Wildlife Refuge and Nantucket’s Downtown Historic District where visitors can catch a ferry to the mainland. The Veranda House Hotel Collection is an upscale, retro-chic inn spread across three buildings with contemporary guest rooms and suites, and modern amenities. Located a short walk from the Steamboat Wharf and Children's Beach, the deluxe hotel features stylish guest rooms with elegant décor, en-suite bathrooms with rain showers and soaking tubs. In-room conveniences include flat-screen televisions with cable channels, iPod docks and iPads, and complimentary wireless Internet, and private verandahs boast beautiful ocean views. Complimentary perks range from continental breakfast served in the dining or on the veranda overlooking the expansive gardens every morning to homemade cookies in the afternoons and beach towels and totes for use free of charge. Set in a beautifully preserved 1893 Italianate mansion with original Tiffany windows, the Wheatleigh is a luxury hotel surrounded by 22 acres of manicured parklands and grounds that offers a tranquil countryside retreat. 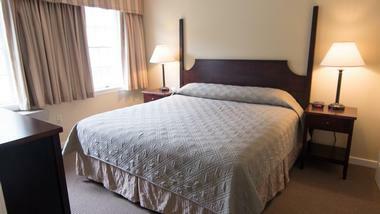 A short walk from the town center of Lenox and the Tanglewood Music Center, the posh hotel features plush guest rooms with period décor and antique furnishings, complemented by modern amenities such as flat-screen televisions, DVD players, and complimentary wireless Internet. Upgraded suites have high ceilings, sitting areas, en-suite bathrooms with soaking tubs, and courtyard or park views, and some have cozy fireplaces. An acclaimed restaurant and bar offer an award-winning exceptional dining experience, and other amenities at the hotel include an outdoor heated swimming pool, a fully equipped gym, and a tennis court. The Winnetu Oceanside Resort is a seasonal family-owned resort in Edgartown with comfortable accommodations and an array of amenities, including two heated outdoor swimming pools, a fully equipped fitness center with sports and yoga classes, and a tennis club. A short walk from the beach and a few miles from the Farm Neck Golf Club, the resort boasts a variety of accommodations ranging from cozy studios to four-bedroom suites and private cottages. All lodgings have kitchenettes or full kitchens, wet bars, flat-screen televisions, DVD players, and private patios or decks with beautiful views. A casual restaurant and a poolside grill serve global cuisine, and a complimentary area shuttle offers rides around the area. Set in the village of Harwich just one block from the town center and with easy access to the Cape Cod Rail Trail for walking, cycling and jogging, the Winstead Inn And Beach Resort is a charming, family-friendly resort with offers inviting accommodations and upscale amenities. The resort is spread over two buildings, which contain well-appointed guest rooms and suites with modern décor, en-suite bathrooms, and in-room conveniences such as flat-screen televisions with cable channels, and complimentary wireless Internet. 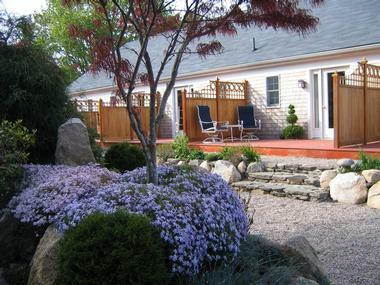 Resort facilities include a heated outdoor saltwater swimming pool with beautifully manicured gardens and a pretty patio area with a water fountain, and guests have access to a private stretch of Nantucket Sound for swimming, sunbathing, and beachcombing.